In which I deduce that the famous Bile Beans ad probably dates from the 1940s or later. 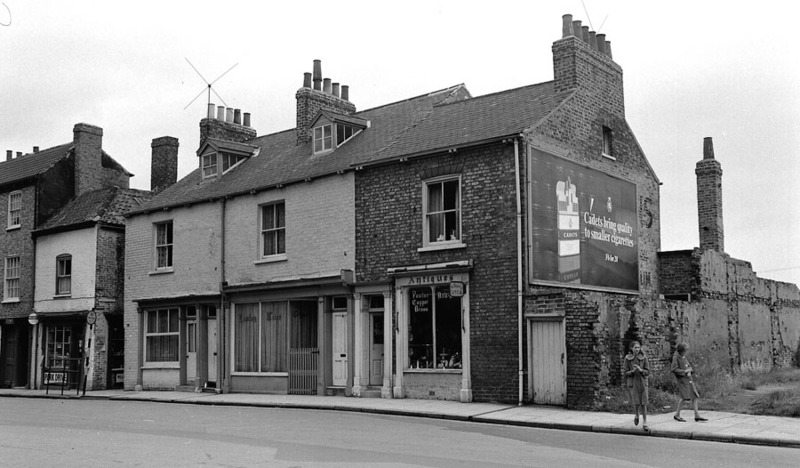 I thought I’d covered all there was to say on our famous Bile Beans ad or ‘ghost sign’ on Lord Mayor’s Walk, but recently received this fab photo, apparently dating from the 1960s. It’s certainly earlier than 1977/8, when Andy took a photo of the uncovered ad, and Baz Ward painted it. The famous sign – in its original form – is hidden behind a hoarding with a poster advertising cigarettes. Just beneath the sign is a narrow passageway, with a door, and to the right of that buildings have obviously been demolished – we can see the imprint left of their floors and walls. In the comments on another page, Stephen wondered why he didn’t remember the Bile Beans advert though he walked along this street many times in the 1940s. 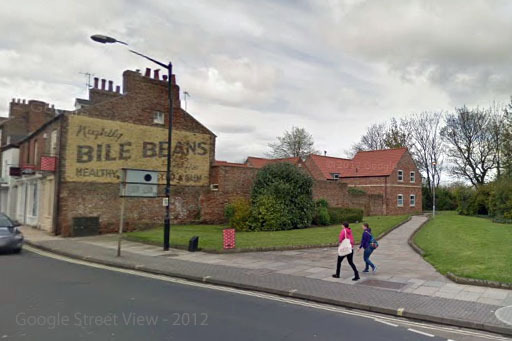 The Bile Beans sign is now prominent because next to it is a grassed open space. But for many years that wall it’s on would have been virtually invisible, one side of a narrow alleyway, obscured by buildings. In the city archives are two images apparently from the 1930s, showing the since demolished buildings on Lord Mayor’s Walk. One displays a very fine example of these old painted signs. I’ve seen a discussion recently on Facebook claiming that this is ‘the Bile Beans wall’. I don’t think that’s right. The phone box perhaps makes it look like it’s the same wall – a phone box was located beneath the Bile Beans sign for many years. 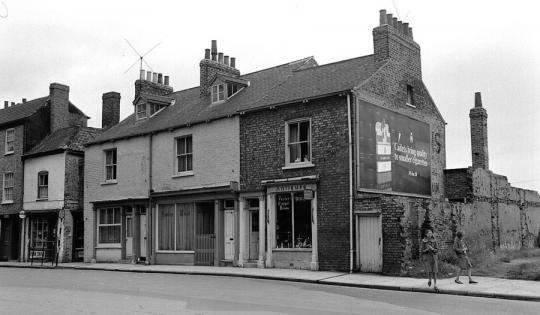 But by my reckoning, these buildings were further along, near the corner of Monkgate. To the right, off camera, is the church of St Maurice (a Victorian rebuilding of the earlier church), also since demolished. Its distinctive railings (shown clearly on another image from the archives, from the Monkgate side) are just visible on the photo above if you enlarge the image. The 1852 plan shows houses crammed into this end of Lord Mayor’s Walk. Groves Lane has only three properties after it now, before the Bile Beans wall. In 1852, from Groves Lane to the corner of Lord Mayor’s Walk and Monkgate there were about eighteen properties facing the street. The land behind had been infilled with cramped-looking terraced housing, in St Maurice’s Court, St Maurice’s Place and Wheatley’s Place. The photo at the top of this page shows the remnants of the narrow entrance to St Maurice’s Court and the marks on the rather ragged walls to the right are the remnants of St Maurice’s Place. 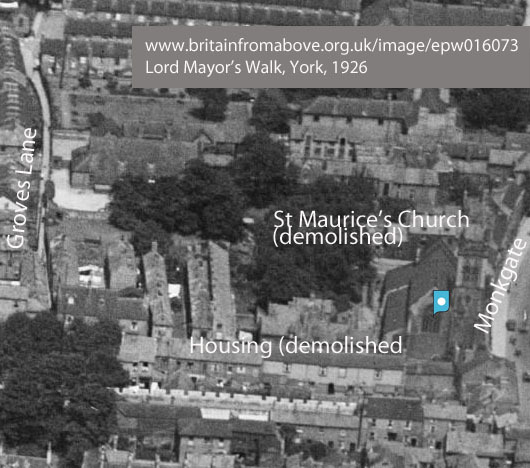 A 1926 aerial view on ‘Britain from Above’ has captured some of these forgotten houses. Aerial view (1926) capturing Lord Mayor’s Walk. Maps and plans available online at old-maps.co.uk suggest that these buildings were standing in 1938 but were demolished at some point before 1958. And the point is … ? 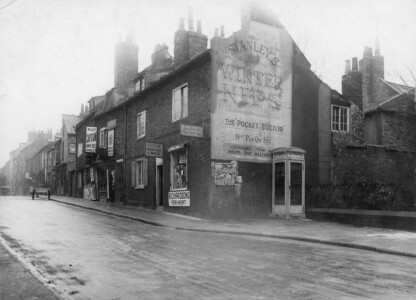 I’m not an expert on these adverts/ghost signs, but I assume the Bile Beans ad would only have been painted after the demolition of these buildings, which were certainly still standing in the 1930s, and possibly weren’t demolished until after the war. I can’t see the logic of painting an advertising sign in a place so narrow and overshadowed barely anyone would see it. So it seems more likely that the original Bile Beans sign was painted in the 1940s or later. And didn’t have very long to convince people of the merits of Bile Beans before being covered by a cigarette ad on a hoarding. Then uncovered in the 1970s, painted by Baz Ward (on canvas/paper), repainted on the wall itself in the 1980s (first restoration), repainted again in 2012. Here captured by Google Street View in 2012, before that second ‘restoration’. Comments and thoughts welcome. And of course feel free to praise my painstaking research. ‘From the 1950s onwards the economics of production swung in favour of mass printed posters and billboards.’ www.ghostsigns.co.uk/about. The photo above appears to capture that swing. Thanks to Jim for the photo at the top of the page. And thanks also to my ‘research assistant’ for not looking too bored when presented with loads of old maps and photos. This page was updated on 29 March 2014 with images from the city archives and Britain from Above, as I now have permission to use them, but didn’t when the page was originally compiled.